The Grade II* church of St Mary-at-the-Quay in Ipswich had not been used regularly since the Second World War, and was at risk of falling into disrepair. Partnering with the mental health charity, Suffolk Mind, the Churches Conservation Trust embarked on an ambitious project to transform the building into an award winning unique heritage and wellbeing centre: Quay Place. In a £5.1m project that was eight years in the making, we repaired, adapted and extended the medieval church, opening to the public in November 2016. Quay Place now features a new modern extension housing therapy rooms, with a café and space for community activities and events in the main building. A mezzanine level provides dramatic views of the nave as well as further meeting areas. Outside a new garden provides space for reflection and enjoyment. 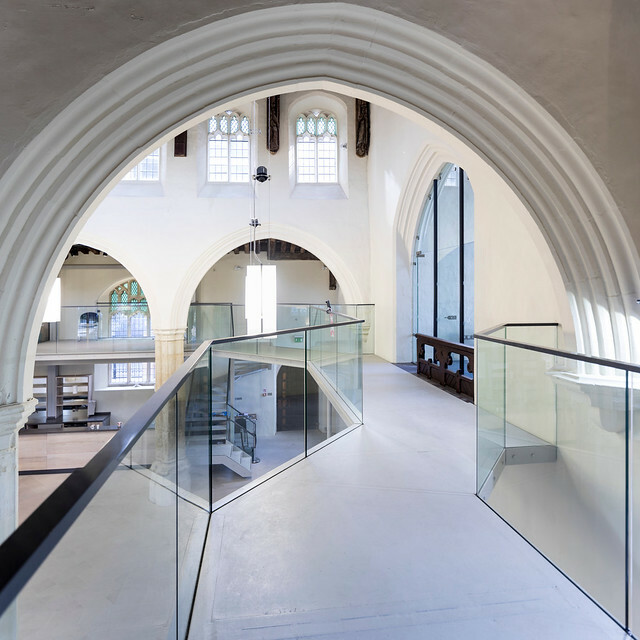 With community participation a key element of the project, the construction phase saw the church used as a living classroom with heritage conservation workshops and open events. Quay Place features imaginative interpretation materials which are the result of collaboration between school children, a local artist, craftspeople and volunteers. These tell the remarkable story of the building, its people, and its continuing place in the history of Ipswich.